Guatemala is in the process of selecting its next attorney general to serve a four-year term: May 2018-May 2022. Because the process and result could have tremendous implications for grave crimes trials and the rule of law in Guatemala, the International Justice Monitor will be providing regular situation reports. 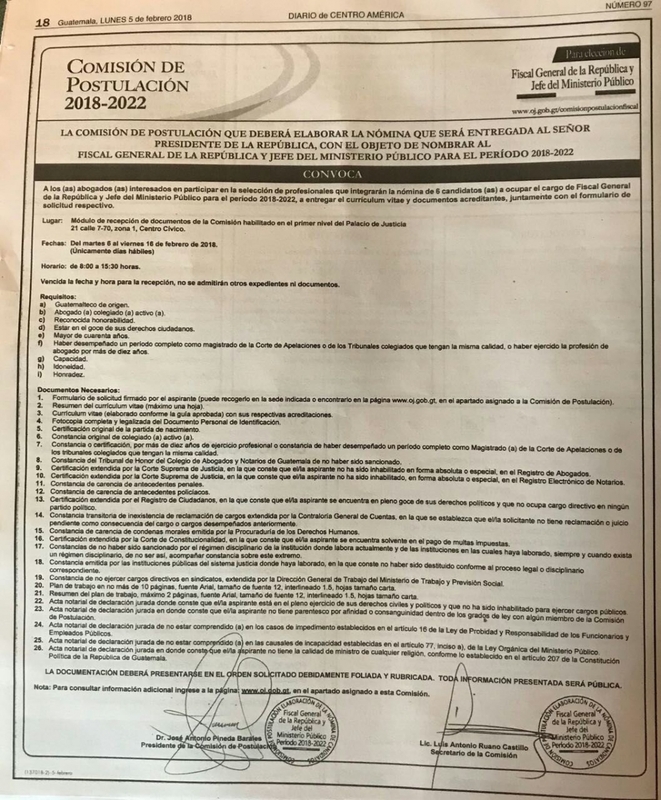 The Nominating Commission (Comisión de Postulación) to recommend finalists for the post of Guatemalan attorney general has received 39 applications. However, it has faced significant criticism from civil society organizations over what they say are deficiencies in its procedures that leave openings for political manipulation. Even as the Commission meets this week to determine which applications meet minimum requirements, various individuals have filed four constitutional challenges (amparos) to its work. Three seek amendment of its procedures, and one seeks its total dissolution. The Nominating Commission met four times in January. On January 22, its 15 members selected officers from their midst, approved the Commission’s working methods, approved interview guidelines, and established a timeline for the Commission’s work. On January 25, the Commission approved the candidate profile. On January 29, it approved the “gradation table” that determines how applications are to be evaluated. On January 30, it approved an application form, guidelines for the presentation of curricula vitae, and a public call for application; it also instructed the Attorney General’s Office to proceed with a public call for applications. The public announcement appeared in an official paper and two other major newspapers on February 5. The application period ran from February 6-16, during which time 39 individuals submitted applications. On Monday and Wednesday of this week, the Commission met to review which candidates meet the minimum requirements. The Commission’s meetings have all been public. They are taped and posted online, along with all information about the process. Additionally, the Commission has provided time at the end of each of its meetings for anyone from the public to speak about the process. Civil society organizations in Guatemala have largely welcomed the Commission’s transparency with regard to public access to working documents and meetings and its openness to public comment. However, many national and international non-governmental organizations have expressed deep reservations about some of its decisions. Generally, critics fear that the Commission’s procedural decisions create openings for the recommendation or exclusion of applicants based on reasons other than merit. Critics fault the Commission for a lack of transparency with regard to the reasoning of its members. When members vote by raising hands (with 10 of the 15 needed for approval), only those who oppose a decision are encouraged (but not obligated) to state their reasoning. Those voting in favor of a decision, including a decision to recommend particular candidates following their evaluation using the gradation table, are not asked to explain their votes. Last Tuesday in Guatemala City, several civil society organizations and the UN Office of the High Commissioner for Human Rights convened an expert panel to discuss the attorney general’s role in combatting grand corruption. The experts concluded that without having to provide justifications for their votes, other guidelines for the Commissioners’ deliberations have little meaning. Another criticism the Commission faces has to do with how it has narrowly defined the scope of formal accusations (tachas) against candidates that may be considered in weighing their applications. The Commission’s gradation table states that ethics qualifications are not measureable but that the absence of tachas constitutes proof of ethical behavior. According to guidelines the Commission adopted, the tachas may not be submitted anonymously and cannot include any open claims, lawsuits, or legal proceedings in courts or with administrative agencies, but only final criminal convictions or other matters that have been definitively resolved. In other words, as it weighs candidates’ integrity and ethics, the Commission has placed beyond consideration whether a candidate is under criminal investigation or has been convicted at trial of crimes but is appealing that ruling. This is happening in a context where many cases and proceedings take years to reach final resolution because the judiciary has been prone to extensive delay tactics through frivolous legal claims [pdf]. Further, the Commission guidelines state that any accusation made on the basis of media accounts will be rejected. Civil society groups argue that the Commission should consider any open legal or ethical complaints, ask applicants about them, and draw appropriate conclusions based on the merit of the information presented. A third main criticism of the Commission that has been especially highlighted by the American Bar Association also relates to the limited information it has decided to collect on each candidate. For example, candidates are not asked for financial and property statements that could help to establish whether they have been living within their means as a result of salaries and other legally and ethically explainable sources. Further, the Commission does not encourage people to come forward with information about the candidates, both positive and negative, that could help its members understand the person beyond their academic and professional backgrounds. These concerns formed the core observations and recommendations in a letter to the Commission’s president from nine Guatemalan and international civil society organizations (including the Open Society Justice Initiative) on February 16. They also form the basis of two legal complaints (amparos) to the Constitutional Court filed by groups of individual petitioners on February 8 and 13. An amparo filed by two individuals on February 7, by contrast, argues that the call for applications went too far in requiring applicants to state such information as whether they have pending fines before the Constitutional Court. The first amparo, filed by a judge on January 24, seeks the Nomination Commission’s dissolution because two of its members (including the chair) have pending legal complaints against them.